Everybody and their brother knows about Facebook these days. Whether finding old high school classmates, building one’s professional network, or sharing photos among friends, Facebook has many uses to millions of users. There’s a new feature on the website for advertisers that allows the ad buyer the ability of progressively narrowing down a target audience by selecting and excluding demographic data. The side benefit of this is that we can parse Facebook’s user data and get a better understanding of its audience and reach. 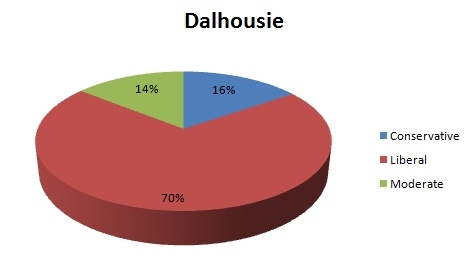 As one goes through college/university in Canada, does one become more or less Liberal or Conservative? Note the slopes on both graphs. 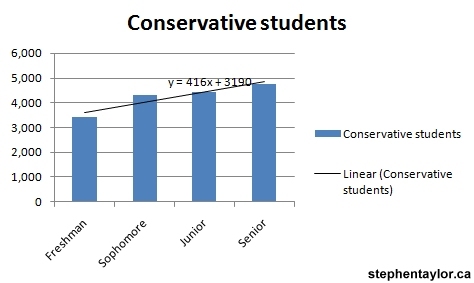 The Conservative graph has a slope of y=416x meaning that as each year goes by, with all else being equal, we can infer that the university experience produces 416 more Conservatives each year of school. 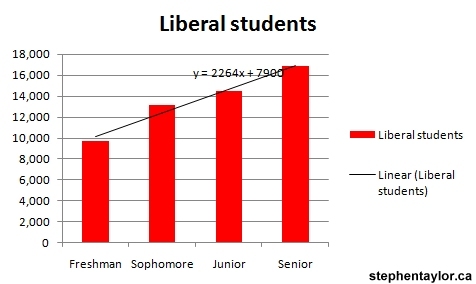 Likewise, the slope of the Liberal graph is y=2264x meaning that if our assumptions are the same, we can infer that the university experience produces 2264 more Liberals per year of the undergraduate experience. It would be beneficial to measure the data over four years, but we can hypothesize from this data that universities are having the effect of producing Liberals over Conservatives at 4:1 per year. As for the ratio of Liberal students:Conservative students? This data was taken from this Facebook page on October 17th, 2007. All data is self-declared by individuals with Facebook profiles. UPDATE: It appears that Facebook has disabled the feature.